So I hope you guys liked the Vanilla Buttercream recipe. Now it is time for Chocolate Buttercream. 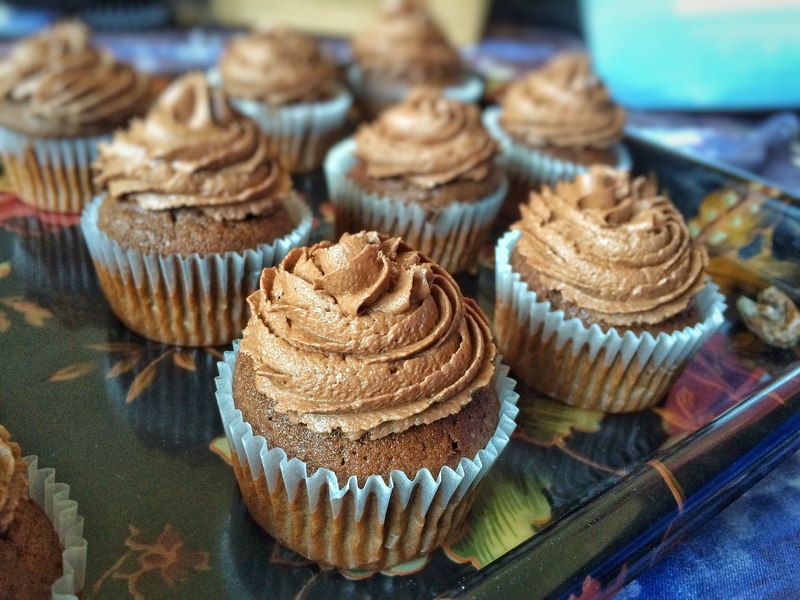 Chocolate Buttercream needs to have the perfect balance of sugar and cocoa. I like the chocolate buttercream to have that perfect chocolate bang when you eat it. Not too bitter but no too sweet either. This recipe here is the perfect blend of sugar and chocolate, and obviously butter! Enough to pipe swirls for 10 cupcakes. In a mixing bowl, cream together sifted icing sugar and butter with a hand/stand mixer. Add 1/4 cup sifted cocoa powder, 2 tablespoon of milk, and vanilla. Mix for 3 minutes. Taste the buttercream. If you feel it is sweet and lacks the chocolate taste. Add the remaining cocoa powder and mix. Keep adding little milk at a time, to get the consistency of Buttercream right. It should not be too stiff, or it wont pipe neatly. Mix it for 3 – 4 minutes till completely blended. Perfect consistency is soft but still will hold stiff peaks. The quantity of cocoa is varied cause it will depend on the quality of the cocoa powder. And also each of us likes the buttercream taste in certain way, so it is better to improvise. Milk, gets the perfect consistency of the buttercream. So add how much ever needed BUT add little at a time. If the buttercream gets bitter because of excess cocoa. Just add some sifted icing sugar. Tastes great with vanilla/chocolate cupcakes. If you try the recipe and like it. Please do leave a comment below. Coming up next – Cream Cheese Frosting.